This recipe is another example of the Tambrahm cuisine’s obsession with all manner of nondescript vegetables, to be more specific – gourds! For the uninitiated, snake gourd is also called Pudalangai in Tamil, chachinda in Hindi, although I have never heard this Hindi name in use. I have always asked for it as padwal (Marathi name) in the vegetable markets. It is a long, snake-like (duh) gourd, around 1-1.5 inches in diameter. Hollow inside, this tube-like gourd carries white spongy seeds inside that are very easy to scrape out using fingers. This is the standard procedure before you slice / chop this vegetable. Cut into manageable lengths of around 6”. Slice open lengthwise, scrape out seeds and membranes, and then slice or dice as per your need. There is also another variety that is much shorter (around 1 foot) and stouter with an ash coloured surface. The prep for both varieties is the same, but the shorter thicker variety has a slightly longer cooking time. Snake gourd too boring for you? The hollow tube like structure of this gourd (especially the more tender longer variety) also makes it a good candidate for stuffing. 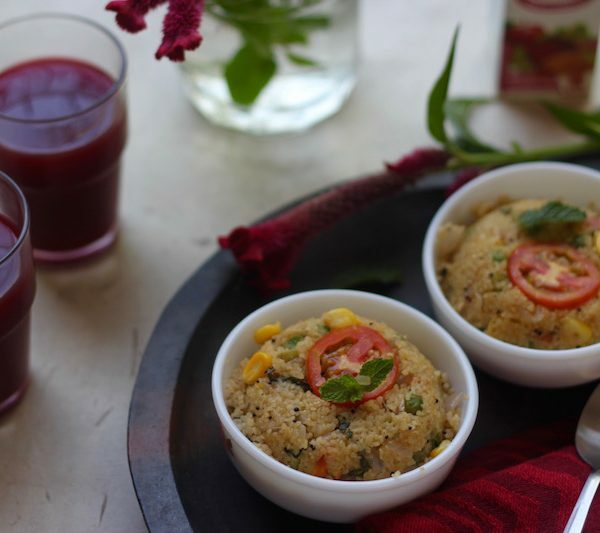 Prepare the stuffing mixture with spiced lentils, paneer, soya chunks or mashed potatoes. Stuff this into par boiled snake gourd and proceed to make the dish of your choice. You can either slit vertically and stuff the boat like pieces or stuff the tube, cut into roundels and either bake or shallow fry or dip in a besan batter and deep fry (YUM). 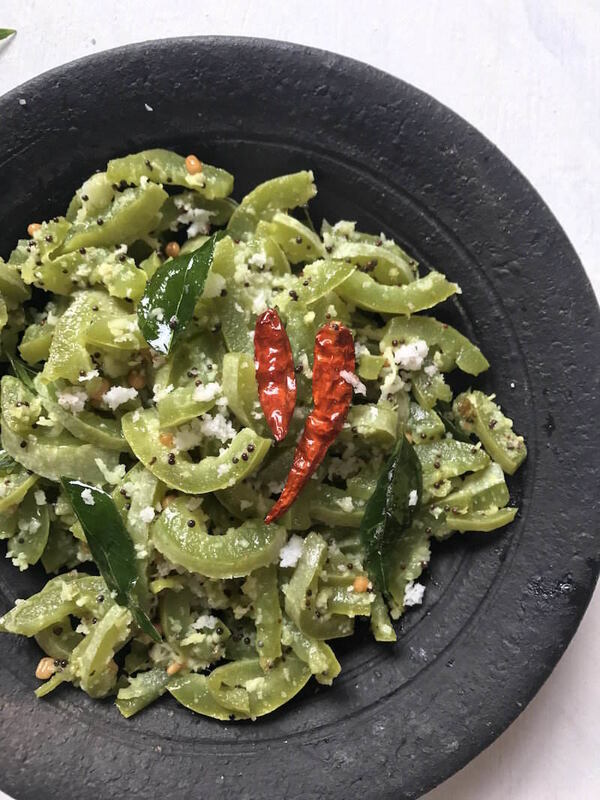 Coming back to this very simple recipe for pudalangai poriyal, it is a mild tasting vegetable side dish that is best paired with a sambar or rasam and rice. A generous garnish of coconut adds a lot of flavour to this dish. There are 3 ways to cook the snake gourd in this recipe. You can either boil in salted water and drain out excess water once cooked. The second method is to steam cook in the pan itself. The third method is to pressure cook, which is what I have used in my recipe. Make sure you pressure cook for a very short period (just until it reaches full pressure i.e. first whistle) turn off flame and open as soon as pressure has come down, to retain the vibrant green colour as well as to prevent it from being overcooked. Microwaving sliced snake gourd with some water in a covered bowl should also work. Snake gourd, like most other gourds has a very low calorie count – just 18 calories and 3 grams carbs per 100 grams cooked portion (Nutritive value of Indian foods – National Institute of Nutrition). Pudalangai poriyal is a good low-cal vegetable dish to include in a meal. It is diabetic friendly too. Instead of the small variety, you can also use the longer variety of snake gourd. Slit open, scrape out seeds and slice into 1 cm thick slices, to get roughly 2.5 cups of sliced snake gourd. Take a small pressure cooker (1.5-2 litres). Place the sliced snake gourd in the cooker with little over 1/4 cup water and 1/2 tsp salt. Close the cooker lid with the weight on. After 1 whistle, turn off flame and release the excess pressure. 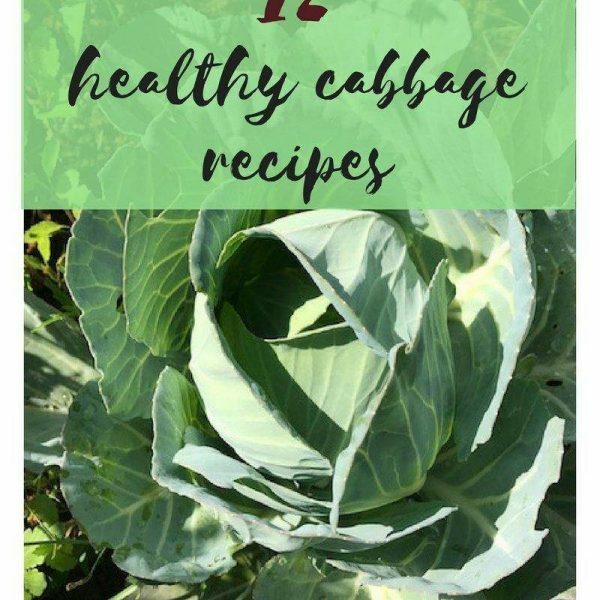 Open cooker and drain any remaining water by passing the cooked vegetable through a sieve. Heat oil in a saute pan. Add mustard seeds, dried chillies, urad dal and curry leaves. Fry until the seeds pop, chillies turn bright red and urad dal turns golden brown. Add cooked and drained snake gourd slices and toss well to combine. Check for seasoning and add a pinch or two of salt if needed and stir gently to combine. Garnish with fresh coconut and serve hot. 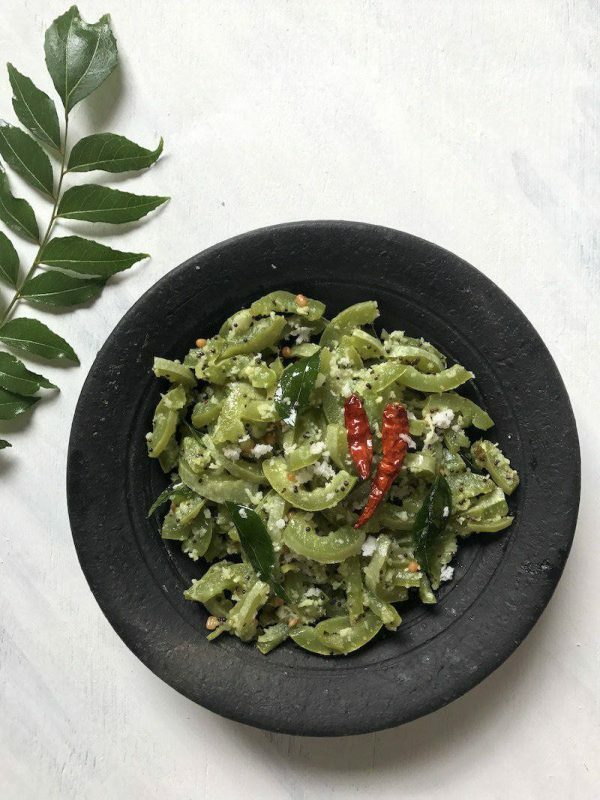 A small piece of snake gourd in the crisper can be combined with all other vegetables to make this mixed vegetable kootu.